Plastic bottles are available in bulk, and can be as inexpensive as the deposit fee you lose by recycling these containers into something useful, all the while keeping them out of bulging landfills. You can create an exciting habitat for your small animals, such as hamsters, with a few plastic bottles you pilfer from the recycling bin. Hamsters are nocturnal creatures, and while you sleep, they're busy cleaning themselves, nibbling contentedly and looking for something to occupy the night hours. 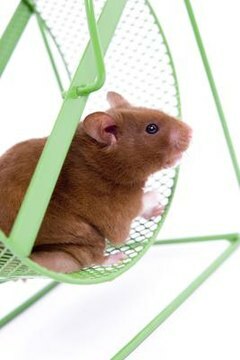 Hamsters love to pack their cheeks with nighttime kibble and tuck themselves away to chew contentedly. Strategically placed water bottles, with both ends cut away and all jagged edges removed, can give your hamsters a safe place to hide, especially if they're sharing their habitat with several other furry buddies. Hamster habitats are available at commercial retailers, and while they can be quite expansive and provide hours of entertainment for your furry friends, they can really put a dent in your wallet. If you're a true do-it-yourself enthusiast, you can take several plastic bottles, with both ends removed, and piece them together to make tubes in which your hamsters can entertain themselves. If you're gluing several bottles together, be certain to use nontoxic glue, as many adhesives contain chemicals which may be dangerous to your hamsters. For a spectacular elevated playground, you can drill small holes along your bottle tubes, add suction cups by pushing the ridge into the holes, and attach them along the edges of your hamster's tank. If you're using a wire cage, you can attach the bottle tubes with plastic zip ties. Plastic bottles aren't just useful for entertainment, they can also make ready-to-use water bottles. Over time, commercial water bottles may become soiled and a bit grungy, or may even crack and begin to leak. A recycled water bottle can provide a quick replacement. Search your recycle bin. You may find a discarded water bottle that will easily screw into the existing metal ball unit from which your hamster drinks. Another useful option is to create a food dispenser from an empty bottle. Wash and dry the plastic bottle. Cut away the bottom half of the bottle and smooth out any jagged edges. Drill a small hole into one side of the bottle, halfway between the bottom and top. Add a suction cup with a ridge by forcing it gently into the hole you've just drilled. A single suction cup should be sufficient, since you'll be placing the top of the bottle into the food bowl, which will help hold the feeder in place. Install the dispenser above your hamster's food bowl with the neck facing downward, and use a small scoop to add critter kibble to the open bottom of the bottle, which will be facing up. Gravity will keep the bowl, and your hamster's belly, full.